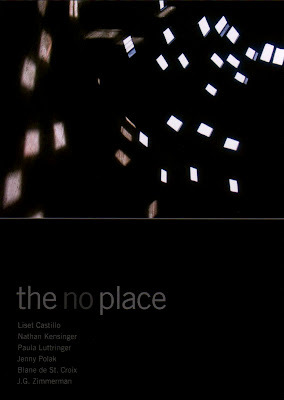 From January to March 2010, the BRIC Rotunda Gallery presented a selection of my photographs as part of a group exhibit titled The No Place. 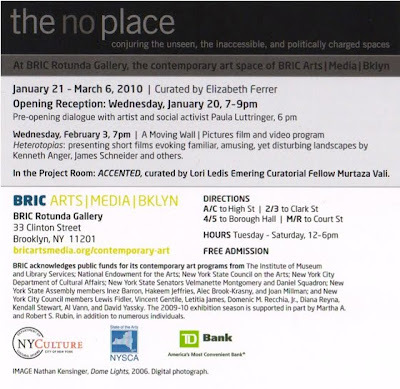 As described by BRIC, The No Place featured "the work of six contemporary artists who conjure utopian and dystopian environments in distinct ways to explore such issues as geo-political conflict, human rights, urban development, the environment, and most broadly, how we comprehend and utilize physical space." The exhibit included several of my photographs from Brooklyn's off-limits waterfront, such as the image above - Dome Lights (2006) - from inside the Revere Sugar Refinery. 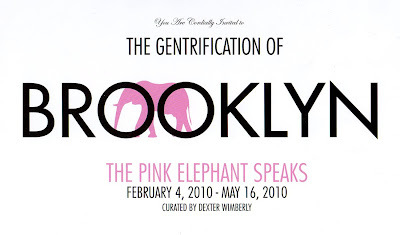 These photographs were reviewed by ARTimesNY, which wrote "Nathan Kensinger’s photos document spaces in Brooklyn that haven’t been touched by humans in years.... What do the spaces we leave behind, never consider, or that are inaccessible tell us about ourselves? The work in this exhibition reminded me of the late-artist Gordon Matta Clark who, in the early 1970’s, investigated similar spaces..."